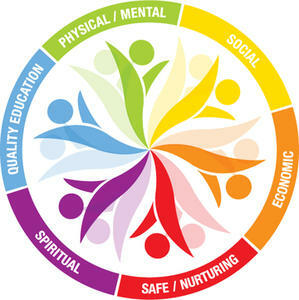 The Whole Child philosophy is grounded in the notion that communities must address and nurture all 6 dimensions of a child’s well being in order to raise a healthy child. Physical & Mental Health This dimension focuses on issues such as pediatric dental needs, mental health, health data collection, health insurance and navigation of the health delivery system. Social-Emotional Development The focal point of this dimension is providing family-friendly information on assessing and facilitating social and emotional development. Quality Education The goal of this dimension is to improve children's development through quality education. Safe & Nurturing Environments "From the crib to the playground" is a good description of the wide scope of this dimension's focus on creating a safe and nurturing environment within the home and neighborhood for children and families in our community. Spiritual Foundation and Strength This dimension provides resources for nurturing the development of a child's spirit including qualities to teach and nurture, reading aloud, places to experience and adventuring in music, movement, drama and the visual arts. Economic Stability This dimension will help hard-working families become financially stable and take the next steps to long-term independence.